Firm Control with an underarm smoothing panel. Silicone edging at hem to keep garment in place. Halston Heritage satin camisole. Cowl neckline. Sleeveless; spaghetti straps. High-low hem; slits at sides. Slim silhouette. Slipover style. Polyester. Hand wash. Imported. Model's measurements: Height 5'11"/180cm, bust 33"/84cm, waist 24.5"/62cm, hips 34"/86cm, dress size US 2. 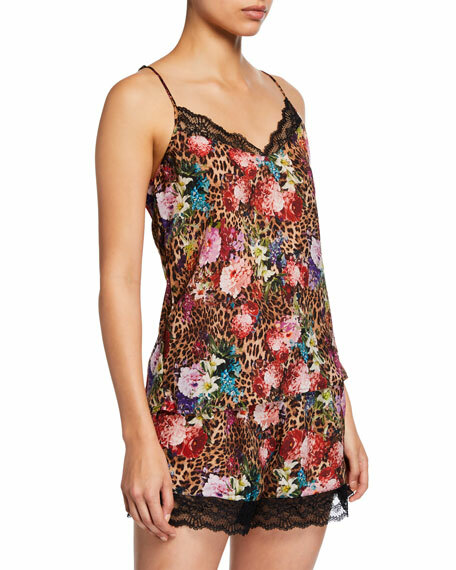 Lise Charmel "Corolle Fauve" camisole in exclusive floral motif. Approx. 15"L down center back. Scoop neckline and back. Thin, adjustable shoulder straps. Relaxed silhouette. Straight hem. Polyester/nylon/spandex. Hand wash. Made in Bulgaria.